Most souvenirs on Lampedusa are based on the Caretta Caretta turtles, or as they are otherwise known, loggerhead turtles. They visit Lampedusa to lay their eggs on Rabbit Beach during July/August. Living in the over-fished Mediterranean does however have its perils and as a result many of them end up caught in nets & bits of rubbish in the sea. They mistakenly eat plastic bags or swallow fish hooks. 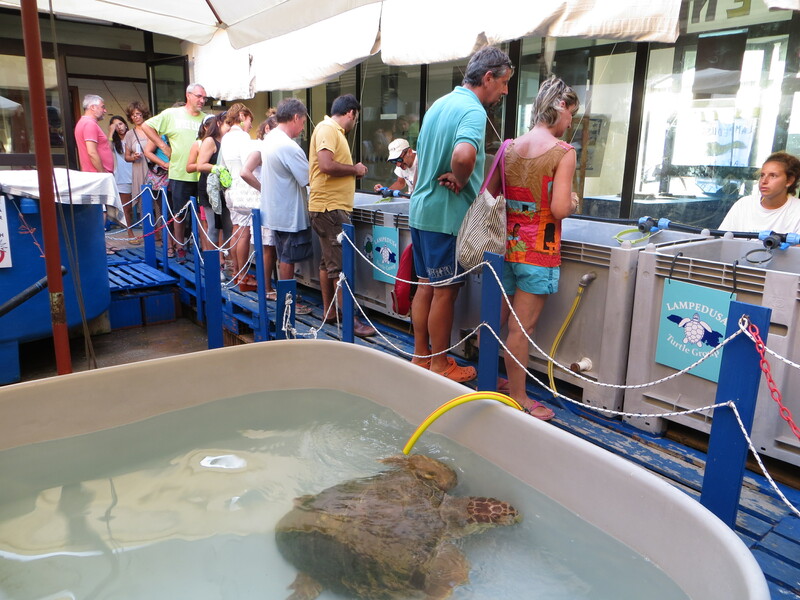 If they are lucky they are taken to the turtle hospital in Lampedusa where the majority recover and are eventually returned to the sea. The turtle hospital on the island is staffed by volunteers who also safeguard the beach where they lay their eggs, predominately during the night. There is heaps of information on turtles around the world, the dangers they face and what they do at the hospital to help them. X-rays are shown of turtles found with fish hooks inside them among other things. The hospital is located in the old port and is open for a few hours in the evening, Mon – Friday. It is your best chance of seeing a loggerhead turtle as they are notoriously shy of humans and rightly so. Staff/volunteers are on hand to talk about their ‘patients’ and their recovery period. As I have already mentioned, most return to sea. One will definitely not. This turtle occupies the middle of the ‘ward’ in a square, shallow pool. It is the first turtle that most people see. It was the biggest there when we visited. 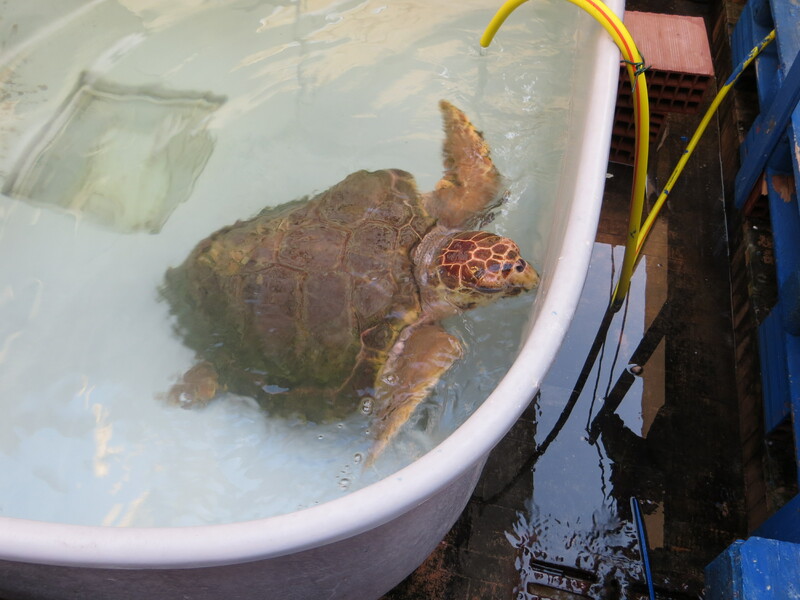 This turtle will never return to the sea, its natural habitat, because its back legs are paralysed. It would never have the strength to swim to the surface for air. This turtle has been there for 7 years already. For me, it is just as cruel keeping it in a small pool where its movement and experience is limited, where people come and gawp and take pictures, just like I did, everyday than it is to let it die. Loggerhead turtles can live up to 67 years, it has already spent enough time in captivity. I admire the work this hospital does but when it can’t fix them, wouldn’t it be better to put them out of their misery? My family once had a cat who lost the movement of its back legs. The vet put her down. This turtle barely moves, just up and down for air. I can only think they are keeping it alive as they are endangered but in the end, if it doesn’t have any quality of life, is it fair? Forever to remain in hospital?